Kameron Hurley is an award-winning author, advertising copywriter, and online scribe. Hurley grew up in Washington State, and has lived in Fairbanks, Alaska; Durban, South Africa; and Chicago. She has degrees in historical studies from the University of Alaska and the University of Kwa-Zulu Natal, specializing in the history of South African resistance movements. Her essay on the history of women in conflict We Have Always Fought is the first blog post to be nominated for and win a Hugo Award. It was also nominated for Best Non-Fiction work by the British Fantasy Society. This past weekend, she won a second Hugo award for Best Fan Writer. Hurley is the author of God’s War, Infidel, and Rapture, a science-fantasy noir series which earned her the Sydney J. Bounds Award for Best Newcomer and the Kitschy Award for Best Debut Novel. She has been a finalist for the Arthur C. Clarke Award, Hugo Award, Nebula Award, the Locus Award and the BSFA Award for Best Novel. Additionally, her work has been included on the Tiptree Award Honor List. 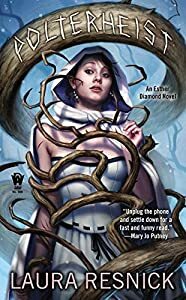 Hurley’s short fiction has appeared in magazines such as Lightspeed, EscapePod, and Strange Horizons, and anthologies such as The Lowest Heaven, The Mammoth Book of SF Stories by Women and Year’s Best SF. Her fiction has been translated into Romanian, Swedish, Spanish and Russian. She is also a graduate of Clarion West. I’ve been invisibly sick for eight years now, but have found it nearly impossible to talk about in fiction. The invisibility of a chronic illness is a funny thing. It’s not until you bring out all your synthetic drugs and syringes and start hyperventilating at the idea of leaving the house without a carton of juice that people look at you funny. When I was 26 I ended up in the emergency room after passing out in my living room. If this had happened while I was alone, I’d be a dead person now, but I got lucky, and I woke up in the ICU and found out I had type 1 diabetes. I couldn’t comprehend that at the time. I ranted about how I ate right and exercised, and the doctor had to gently tell me that type 1 diabetes was actually a chronic immune disorder, and had nothing to do with what I ate or how much I weighed. It was not something that could be managed with diet and exercise. My body had randomly decided to eat the cells in my body that made insulin, which regulated my blood sugar, and it killed them. Those cells were not coming back. In order to live, I needed to manage my blood sugar manually. The automatic system that regulated it for me was forever broken. I was angry about this for a long time, but I was alive. And living is something. Having an invisible limitation means I have the privilege of navigating spaces while giving the appearance that I’m not ill. But though outwardly, I have no limitations, in truth I live in a deep and constant fear about having access to the synthetic stuff that keeps me alive. I spend an inordinate amount of time balancing the exercise I want and need with my insulin shots and food intake. This involves taking my blood sugar reading 5-6 times a day, drinking juice when the count is too low, and taking a hit of insulin when the count is too high. Add to this the fact that exercise usually drops my blood sugar (but by how much is often uncertain) and certain types of foods in certain combinations raise it rather unpredictably (the carb/fat combo of something like pizza means testing my blood sugar and taking shots every three hours for about nine hours afterward). When I wrote my second book, Infidel, I tried giving my heroine a chronic illness similar to mine. She gets badly infected, and starts the slow descent into weight loss and exhaustion, much as my year had been leading up to that emergency room trip. But when she finally passes out and wakes up in her world’s equivalent of the emergency room, I found I couldn’t go through with it. It was too painful. I wrote that heroine in part for my own escapism; giving her limitations like mine would have broken my heart. So I cured her. Because I’m a writer. I can do that. I cured her, and I tried to forget about it. But I found that in pulling that punch, I was unable to forget about it at all. I thought about how I couldn’t pull the trigger on that over and over and over again. I knew I wanted to write about a female heroine with limitations who was still heroic. Not every heroine needs to be Conan. In truth, it’s a far more heroic thing to be a hero with limitations than a hero with limitless persistence and strength. When I wrote my new novel, The Mirror Empire I knew I wanted a protagonist with a chronic condition, a physical ailment that she needed to manage, but I wanted whatever it was to be as different from my own as I could manage while still writing honestly about them. The closer her limitations were to mine, I knew, the more likely I’d be to pull my punches. So when Lilia, my primary heroine, walks onto the page, she gets her first injury at the end of the first chapter. Unlike a chronic illness, this one restricted her movement, and it was visible – people noticed it, and she had to manage not only her own capabilities, but their expectation of her capabilities. It was, I realized with my own illness, often far more exhausting to disabuse or educate others on my actual limitations than to endure them myself. People have very limited knowledge of my particular illness, and people make assumptions about Lilia’s mobility often as well, much to her annoyance. Even in very early drafts of The Mirror Empire, Lilia had asthma, and I wanted to keep that in the final version as well. I have a very young niece who has chronic asthma. She’s spent a great deal of her childhood in emergency rooms, getting shot full of steroids and gasping for air. She goes nowhere without an emergency pack of medication and various inhalers. As both of us have to deal with the expectations of our capabilities from some of the same sources – in this case, my parents, who are leery of taking her anywhere in the same way they get anxious about me eating on a regular schedule because what happens if you don’t take your medication at the exact same time of day? – I sympathize with her quite often. When I rewrote Lilia’s coping with asthma in the final version, I drew on my experiences with my niece. I knew it was going to affect how much physical exercise she could engage in, and how she’d have to be constantly aware of her other triggers to manage and minimize her attacks. And, again – I was very much aware of how others would make assumptions about her based on the knowledge of her asthma, and how she would often prove them wrong. Lilia is given many more hurdles to overcome as the book progresses – some physical, some emotional, some literal – but making life harder for her than it may be for others, or at least the “others” we often seen represented in fiction, in media, made her a far more complex and truer character, to me, than she would have been otherwise. And of course, she is not the only character in the world who must carve out a place for herself while starting eight steps behind someone other narratives might place in the primary protagonist’s seat. Writing about Lilia’s life, and how she navigated in a world of others’ expectations and managing her own boundaries, was far easier for me than trying to write a more direct allegory of my own experiences. Sometimes you need some distance. You need to take a step back. Thanks for this, Kameron! One of my best friends had a similar experience to yours. I’m really looking forward to your book. And I really liked that the challenges and obstacles Lilia had to overcome really varied, and the ways she approaches them is a real highlight of the novel. Even if this is an epic fantasy with a wide lens, it feels to me as if she is the real heart character for you in the book. Reading about Lilia and her lung issues… I think I felt my own lungs aching in sympathy more than once. I’ve been there. Before I had a decent doctor who actually diagnosed me with asthma, I had a lousy doctor who constantly kept diagnosing me with lung infections. Repeated lung infections. Which I may well have had by the time she saw me, because of the sheer amount that I couldn’t keep my lungs clear and had trouble breathing. It took multiple trips to the emergency room before some people started to notice that there was a problem and forced the issue, getting me a diagnosis of asthma, plus regular prescriptions for inhalers to help treat it. Before that, though… I remember sleeping practically sitting up because lying down was sufficating, and I remember bending over to tie my shoes and my mother looking terrified because she said when I did that, she saw my lips start to turn blue. So Lilia’s asthma really sruck home with me, and was terrifying in the way that seeing personal issues reflected in characters often is.